I looked high and low for some advice on how to make this work, but couldn't find anything obvious. 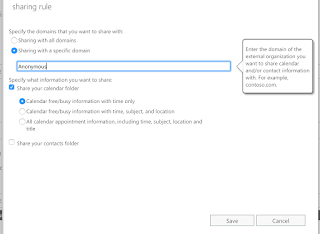 Then I stumbled across an obscure reference to setting up sharing with Anonymous domains in the Office 365 Admin Center. Login to the O365 Admin Center. Navigate to the Exchange Admin page. Go to Organization settings, then Sharing. 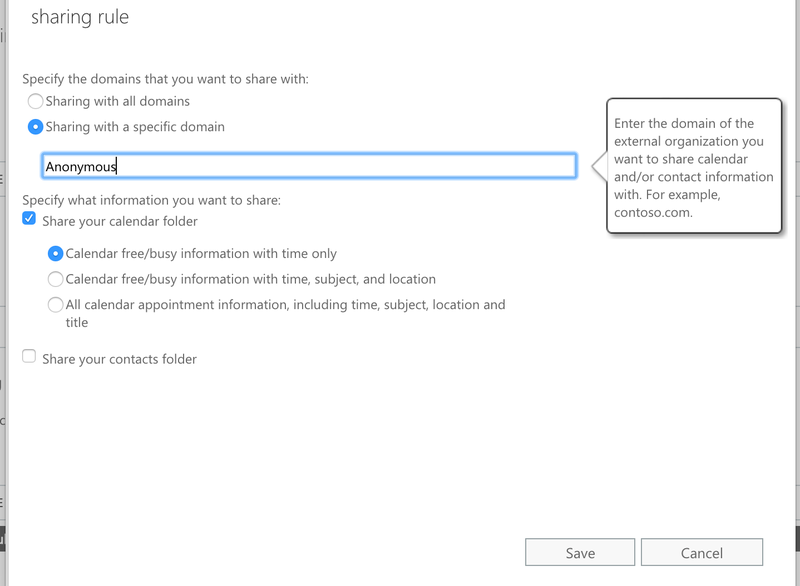 Edit the default sharing policy under individual sharing. Add a new sharing rule. Select "Sharing with a specific domain", and enter "Anonymous" as the domain. Save everything, then go back and share with a non-365 user. At work, we recently made the move from GitHub to AWS Codecommit for our private repositories. There’s lots of tradeoffs moving to CodeCommit at this time, like the loss of a web UI, wikis, issue tracking, pull requests, etc. But we made the move as part of our company-wide cost saving measures, as we found CodeCommit to be quite a bit cheaper than GitHub (like free, since we fall into the free tier at this point). So, how did we migrate all of our GitHub repositories at once? Well, we didn’t do it by hand, that’s for sure. Note: If you have two-factor authentication enabled in GitHub, you’ll need to get a personal API token to use in place of your password. You can generate this token here. Next, we used a script to loop through all the repositories, clone them locally, create a repository in CodeCommit, and finally push to CodeCommit. You’ll need the aws cli tools installed locally. I used ~/_trash as my local working folder. Once we had all of the repositories moved, we just needed to repoint the origin for our local repositories to CodeCommit. After a few weeks of making sure we had everything, we backed up all of our GitHub repositories one last time using this script, and then we deleted all of our repositories in GitHub. Note your GitHub account or generated token will need to have the delete_repo scope in order to delete a repository. You can find all the scripts in this Gist. Packaging was very nicely done. Hardware these days comes in some really beautiful boxes that are well designed. I'd rate packaging 10/10. There are no instructions in the box. None. It was pretty intuitive to get it out of the box and figure out what to do, but I did hear from a friend that he wasn't sure how to get the outer shell off. He didn't want to break it by pulling or twisting the wrong way. Initial setup using an iPhone 6 with iOS 9 beta failed. After connecting to the setup Wifi network, the Google On app would never find the OnHub. I worked on this for about 45 minutes before giving up and trying the setup on an iOS 8 device. Setup worked perfectly. Once I figured the whole iOS 9 thing out, setup was so simple. Great job on making it painless! Wifi signal strength in our house has had a major upgrade. Corners of the house that were always very weak signal now have full strength connections. Throughput for both wireless and wired clients test out with speeds matching our service from Comcast. I also like that I do not have to be connected to the local network in order to manage the OnHub. So, when someone at home can't connect, I can open the OnHub app anywhere I am and manage the network (so long as my home Internet connection is up). That's pretty cool! A few days ago I picked up my first drone, a Phantom 3 Professional. It's so much fun! The Intelligent Flight Battery is upgraded during the aircraft firmware upgrade process. It is recommended to keep the upgrade package files in your SD card. The upgrade will start automatically after power cycling the aircraft. Put the spare battery into the aircraft. Place the firmware update package in the root of the SD card. You can just leave it there. With the controller off, turn the battery on. The upgrade process will kick off. Once you here a long beep, short beep, pause, the upgrade is complete. Rinse and repeat with all of your spare batteries. Neither of these cases was true for me. However, the first one pointed me in the right direction. Somehow a script I was calling out to (logging.ps1) had it’s contents removed. Had the file been deleted, the error would have been that the cmdlet, function etc was not recognized. But having the file present but empty gave the misleading error “AuthorizationManager check failed”. So, if you are getting this error and everything else looks correct, look and see if something similar is causing your problem. File this one under Duh! I was troubleshooting a routing issue I was having with a portable area in ASP.Net MVC. For some reason I kept getting a 404. The solution was pretty big, so I created two new projects to try and isolate the problem. I created a new web project and a class library for the portable area. Added my routes to the area, created a new class, renamed the class MyController, wired it all up, and got the same thing. I installed Glimpse to see what routes were being hit. But Glimpse only works if ASP.Net handles the request, and since it was a 404, I couldn’t see the Glimpse data. So I installed Phil Haack’s awesome route debugger. The route debugger has a catchall route, so even if the request would result in a 404 it will return you back the debug information. I could see that the route was being hit, but it still 404’ed. I set breakpoints. I added some logging. Nothing would cause my controller action to get executed. Then it struck me. Visual Studio by default creates new classes without an access modifier, and when no access modifier is specified, the default is internal. MVC needs controller classes (and the action methods) to be public so they can be constructed via reflection. The really sad part is I just helped a colleague solve the exact same problem the week before. I don’t know why Visual Studio defaults to not putting a access modifier on new classes. I always prefer to be explicit with such things. I came across this exception this morning while playing with RavenDB. A quick search shows several people have seen this exception but not a lot of solutions. I’m not sure why, but this exception in my case was related to IntelliTrace. I turned IntelliTrace off and the exception went away. Weird. BTW - this isn’t related to RavenDB. According to this post, the issue is a bug in IntelliTrace.